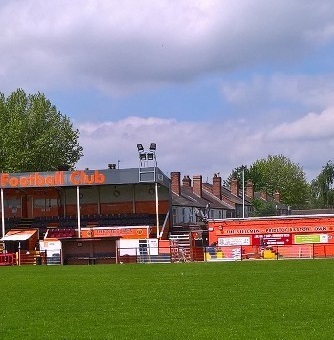 New outdoor LED flood lights have been installed at Bilston Town FC by Excel Electrical Contractors, ready for the 2017-18 season. The Queen Street Stadium, home of “The Steelmen”, hosts football matches for many age groups. The outdoor LED flood lights will be put to the test during the Bilston Floodlit Cup between September and February. They will also see action during other competitions throughout the season. We were called to replace the old column floodlights with new and more energy efficient outdoor LED flood lights, which over the course of the season will save the club money. Good luck to all the teams taking part in the 2017-18 season. When you need to illuminate a large area like a sports field for football, cricket, hockey, or athletics. Look no further than Excel Electrical Contractors. We can get your stadium and training pitches equipped with outdoor lighting ready for the Autumn and Winter months so that you can carry on training and playing with excellent visibility even when the nights have drawn in. Lighting design and installation is just one of the services we provide in Wolverhampton and across the West Midlands region. We also install fire alarm systems, security lighting and CCTV too. If your business premises, sports ground, or car parks needs outdoor lighting, like outdoor LED flood lights, or security lighting then get in touch with us at Excel Electrical Contractors. We are Wolverhampton’s premier industrial electrical contractors and have a proven record in installing area lighting, outdoor LED flood lights, security lights amongst many other types of outdoor lighting installation. To find out more about our complete commercial electrical services, please contact us.